Listen to documents, e-mails or web pages instead of reading on screen! Convert text to MP3 or WAVE files for listening later with your portable MP3 player. Video Converter can Convert AVI, MEPG1, MEPG2, Windows Media, Real Media, QuickTime Media to VCD, DVD, SVCD, DV. So you can add any media file format including MPG, WMV, ASF, AVI, VOB, RM and so on. Mobile Ringtone Converter can Convert / Record / Mix audio to Moblie Ringtone format as MP3, OGG, AMR, MMF ,AMRWB, WAV.. 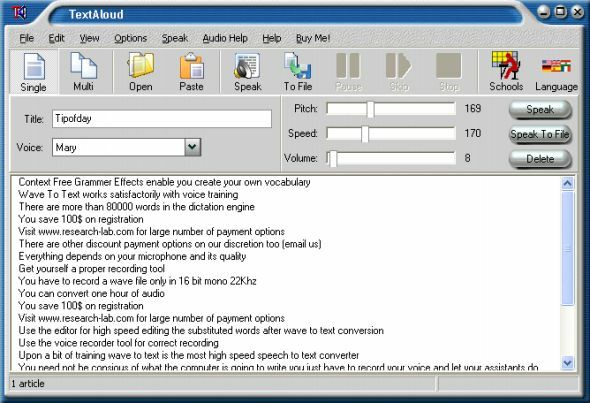 It can convert audio to Mobile Ringtone as MP3, OGG, AMR, MMF, AMRWB, WAV.